Native to Central and South America, Money Trees are an excellent plant for both indoor and outdoor growth. This plant can range from a few inches in height to over seven feet tall. It originated in Japan and consists of several trunks wound together with green leaves sprouting from the top. A story associated with the money tree is about a man whose prayers for money were answered because of this unique plant. When he took the plant to his home, the man discovered he could grow several more from the seeds and became rich from selling the plants. It is from this story that the plant was given its nickname: the "money tree". Braided Money Trees are usually given as a gift; they are reputed to bring good luck and prosperity. Generally, the more leaves the Money Tree has, the better! While it is common to find money trees with five to six leaves on each stem, it is quite rare to find one with seven leaves. Like a four-leaf clover, a Money Tree with a seven-leaf stem is considered to bring incredibly good fortune to its owner. 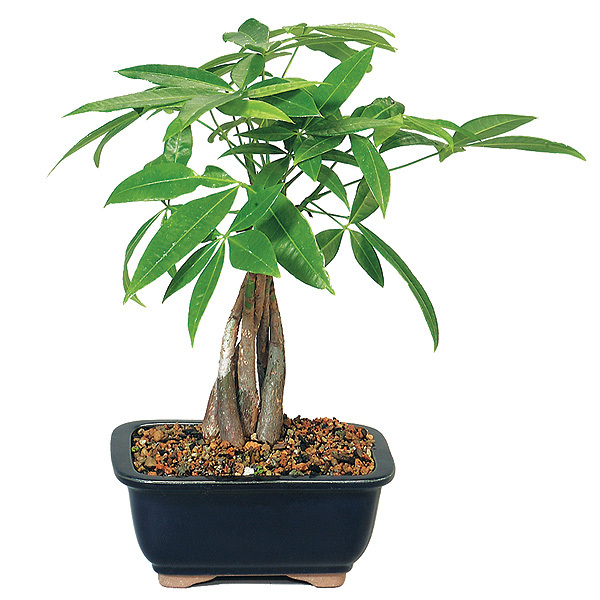 Money Trees are also very popular plants with Feng shui practitioners who believe that the braided bonsai creates positive energy for any room that it placed in. According to this belief, you will want to place your money tree in the "financial" part of your home or office. Each new leaf of the tree will then bring added financial blessing and success. Easy to grow and beautiful to behold, this bonsai is happy wherever you are. A Braided Money Tree is a lovely and rare plant that can make an outstanding addition to any room in your home. This tree is composed of several trunks that wind around each other, it can reach heights anywhere from a foot tall or more. The bonsai version is around a foot tall, while the fuller sized trees can tower up to seven feet tall. The jade green leaves of the Money Tree grow in tufts of five in a pattern often compared with the human hand. These five leaves are said to symbolize the five elements of balance in creation: metal, wood, water, fire and earth. With its shiny green foliage and blooms on tall green trunks, it has become a popular indoor plant but is also cultivated for its edible nuts. The Money Tree, also known as Pachira aquatica, is a miniature tree characterized by multiple intertwining trunks. Each tree is actually four to five separate trees with their trunks braided together. Taking care of any type of bonsai plant requires time and planning. By incorporating some simple tips, your Braided Money Tree will thrive for years. Growing one from a seedling requires expert knowledge, and will take years to grow to its maximum potential. With any bonsai plant, watering is crucial. Most bonsai like to have plenty of water, but proper water drainage is key. This is maintained by two very important factors: soil and the pot. The soil should contain a mixture of earth and small gravel pebbles which lie in the pot with one or more drain holes. These holes need to be covered with mesh, to allow the water to flow freely but retain the soil. You can also add some river rock to the mixture, to create porous areas in the soil which aid in draining. Some bonsai even grow well in a mix of peat, vermiculite and perlite. Our Bonsai All Purpose Blend provides the perfect amount of airiness and nutrition for your Money Tree. The Braided Money Tree prefers much less water than other plants - once a week is sufficient. Some do well on as little as a cup of water per month, but the amount varies with the pot size and soil composition. Misting the plant is also another recommendation. It helps the plant leaves get extra moisture and keeps them free of dust. Our handy Haws Mister can be pressurized with just a few quick strokes for continuous spraying for your Money Tree. The soil in the pot should be allowed to dry completely out before another watering. There are several ways to realize if the amount of water is adequate. If the plant’s leaves become droopy and yellow this is a sign of too much water. When the leaves are wrinkly and curled up, this means you are not watering it enough. Place in an area of moderate sunlight. These plants can survive with varying degrees of sunlight, but do best with a few hours of sunlight and a few hours of shade. If your plant experiences too much full sunlight, the leaves may begin to burn. If weather permits, your Money Tree will enjoy being placed in a sunny to partial-shade exposure outdoors daily. In very warm climates or during the heat of summer, light shade is a better option to prevent leaf burn. Avoid direct sunlight for prolonged periods of time as this will cause the leaves to burn and turn slightly yellow. For indoor plants, provide bright indirect light and turn the plant regularly toward the light source to keep it growing straight and leafing evenly. In darker areas, leaves grow smaller but Money Trees can survive for a long time in very poor light. Being a native of a wet, hot region, the plant will not fare well when temperatures drop. If you keep the plant outside on the porch, you need to remember to bring it inside when the temperatures drop below 50 degrees. It is unnecessary to give the tree fertilizer often, specifically in the bonsai plant size and style. Fertilizing once in the Spring and once in the Fall with Time Released Bonsai Fertilizer is sufficient. Try our organic Seaweed Fertilizer for fantastic results. Trimming the dead leaves and providing plenty of fresh air, will allow your Braided Money Tree to live for many years. Prune the leaves to encourage growth. If you want new leaves to sprout, or have a wilting plant, prune off the browning leaves. Leaves can be trimmed at any time of the year, and you will notice that they grow back quickly. This Bonsai is usually presented in a braided or knotted form which is achieved when the stalks are young and supple. The money tree can be pruned by cutting off the stem, and new growth will appear at the cut over time. With careful maintenance, you can direct the growth of your plant in a style that is most pleasing to you. See our Tinyroots Bonsai Shears for precision and the ultimate in lifetime bonsai tools. Money Trees are very hardy and are not susceptible to bugs in general, however, if whitefly or aphids invade, combat them with a solution of dish soap and warm water. Spray the leaves until the solution runs off and then rinse the leaves with clean water. Repeat as needed. Be sure to resist over watering as this is a major source of Money tree death due to root rot. Propagation is best had from cuttings/side shoots and seeds. Often you will notice new shoots coming out of the trunks. You can simply place these shoots in moist, not wet, soil and they will grow well. You can Re-pot your Money Tree every two-three years during the spring season, or if you notice that your plant seems overly thirsty. Be sure to prune the roots gently and provide a quality soil cut with river sand to ensure proper drainage. When you are ready to re-pot be sure to check out our amazing selection of beautiful bonsai pots.